ASTM A335 Pipe (ASME S/A335, Chorme-Moly) is a seamless ferritic Alloy-Steel Pipe for high temperature service. This pipe specification shall be suitable for bending, flanging (vanstoning), and similar forming operations, and for fusion welding. 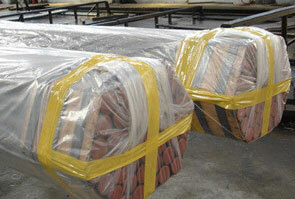 Sometimes referred to as “P Grade”, chome moly pipe is popular in P-Grades P5, P9, P11, P22, and P91. The most common use of grades P11, P22, and P91 is in the power industry and petro-chemical plants, Grades P5 and P9 are commonly used in refineries. Wall Thickness - Schedules 40 through 160, STD, XS, XXS. Seamless Pipes for Nuclear Plants etc. Do you need your ASTM A335/ASME SA 335 P5, P9, P11, P22, P91 Seamless Pipes, Tubes shipped to you internationally? 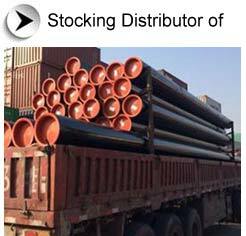 Not only do we ship all of our Steel Pipes / Tubes globally, we will consolidate the order for you and ship it to the closest port near you. We have gained several Orders of ASTM A335/ASME SA 335 P5, P9, P11, P22, P91 Seamless Pipes, Tubes from countries like US, Canada, Chile, Brazil, UK, Italy, Venezuela, Belgium, France, Portugal, South Africa, Nigeria, Mexico, China, United Arab Emirates (UAE), Peru, Bahrain, Saudi Arabia, Qatar, Kuwait, Jordan, Malaysia, Thailand (Bangkok), Singapore, Indonesia, Sudan, Kazakhstan, Australia, Israel, Kenya, Russia, Tunisia, Vietnam, Colombia, Iran, Iraq, Sri Lanka, etc. 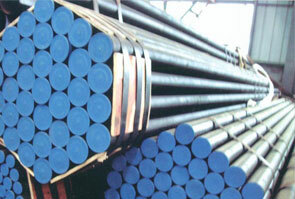 Each ASTM A335/ ASME SA335 P5b Alloy Steel Pipes is marked with tube type, heat number, steel grade and size. Other markings, such as stamping, can be made on request.